Circus Summer is more than what I expected! Kailin Gow fills readers with mystery, danger, and downright scary action. From its brave-hearted characters and underlying tension, the first book of the Circus of Curiosities series will definitely turn heads. The Circus of Curiosities is a show that must always go on. No matter that its dangerous and violent. No matter that the participants, or contestants, are only teens. The Circus is more than meets the eye and it's not evident to all except for Leela Sinclair and Zachary Niles. The two Sea Cliff residents find their destinies in becoming circus performers, and even beyond if they win. Leela and Zachary are brave souls. There's much suspicion regarding the circus, an aura of danger and violence surrounds the excitement. That doesn't stop the two from signing up or not quitting when the circus acts become deadly. Not even when they learn about the truth of the Invaders, who are somehow connected to the Circus of Curiosities. The Invaders are the source of strife for many towns across the country referred to as The United. The Invaders, the war, and the fact that the standard of living is not well are a few details that label Circus Summer as a dystopian novel. However, while reading I didn't quite feel post-apocalyptic vibes and I believe that stemmed from not knowing enough about 'the war', what has caused Leela's world to decline, or the parameters of who in the world has been affected by the war. I felt like I was placed in a point of Leela and Zachary's story without knowing what factors brought me to that point. 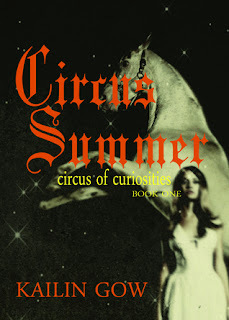 There are just so many questions regarding the world Circus Summer is set in and Kailin only dishes out a few answers. My brain is all over the place trying to put the pieces together, but I can't because I don't know everything. This is one of my favorite aspects of Kailin's novels. She never reveals too much information right from the beginning of a series, and her writing always hints that there's a bigger picture. The characters are lovable with perfect traits: protective, determined, and wise. With the exception of the prologue, the entire story is first person perspective. Every so often readers read a chapter from Zachary which is a brilliant way for many sides of the story to come to light. Zachary knows things about the circus that Leela doesn't and his insight helps keep the story on the right track. Anyone who picks up Circus Summer is in for a wild ride. There's no way to stop reading once started. After discovering so many strange events it's appropriate to say that the Circus of Curiosities series will only get "curiouser and curiouser". Some of the most impactful books and films I read or watched when I was in my teens and twenties were dystopians. Ray Bradbury’s Fahrenheit 451, George Orwell’s 1984, George Orwell’s Animal Farm, Lois Lowry’s The Giver were books that made me think, made me wonder what ifs, and made me think about societies so oppressive and repressive that those who live in them would eventually rebel. Films like Equilibrium starring Christian Bale and the book to film blockbuster Total Recall, now a major motion picture re-make of the 1990 film, now starring Colin Farrell, Kate Beckinsale, and Jessica Biel made me fall further in love with the genre. A dystopian society is one that is repressive and oppressive, often disguised as a society of perfection or utopian. The fact that this society is not utopia, but one that is dytopia and filled with oppression to the point of slavery, is one that I’ve always been interested in for many reasons. 1) As a sociologist (trained in Social Ecology at the University of California at Irvine), dystopian fiction is one of my favorite genres to write because of the possibilities of a world that can be explored, and the impact society has on people. 2) The history of humankind has shown we have had and continue to have some societies that are dystopian. There are people and societies out there that currently suffer from an oppressive government. Dystopian fiction, especially for teens, tend to be cautionary tales of a society gone wrong and a government with too much power. 3) Dystopians, like fantasy, lends itself well to imaginative world-building. I like to mix genres and push the genre of dystopian so it is not just about people, but about human qualities. A good dystopian will make you ask questions about human nature. Circus Summer, the first book in the Circus of Curiosities Series is a dystopian fantasy, which means it is a dystopian, but has a strong element of epic fantasy (for me, that means the characters may or may not be entirely human and/or the battle scenes will be large). The other dystopian fantasy I have is the Desire Series, about a perfect society called Arcadia, which is far from it, and The Fire Wars Series, which is also a fantasy mythology. Finally, my other dystopian series is FADE, a dystopian thriller. As you can see, I do mix genres, especially with dystopian. It’s another way to explore the world and genre of dystopian fiction. It’s another way to expand our imagination and go beyond what we think are boundaries. Breaking through the typical dystopian formula and structure by pushing to the edge what is considered “dystopian” and enhancing current dystopians is what I love to do with my books. Thank you for letting me share Circus Summer with you!